I have a coffee maker that I like quite a lot. (I gave up on cold brew coffee because I’m kinda lazy.) My parents have one just like it and I wanted to copy them. 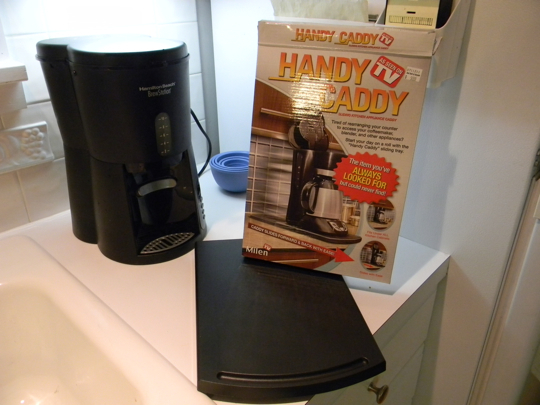 I like it because there’s no carafe – it has a holding tank instead. On the weekends I brew a pot on Saturday morning, drink half of it throughout the day, turn it off, then finish the pot on Sunday. 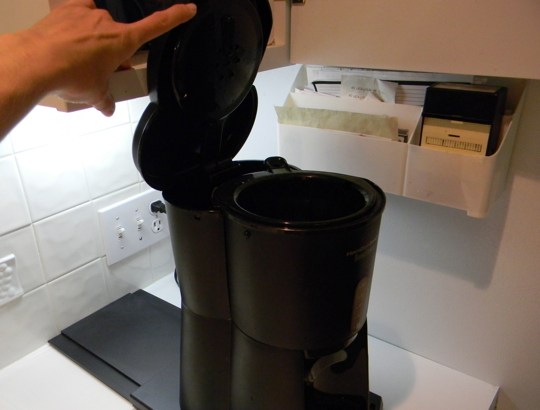 The thing I don’t like about this coffee maker is that it is unwieldy. Granted, I’m only using it once a week, but it’s once to pull it out from under the cabinets and fill it, replace it, then another time to dump the grinds. Whew. That’s too much work. But wait! Bed, Bath and Beyond to the rescue! I was so excited to buy something so frivolous. I didn’t even do my standard ‘walk away and see if you really want it in five minutes’ ritual. I grabbed the box and made a beeline to the checkout. Um, it doesn’t really work for me. 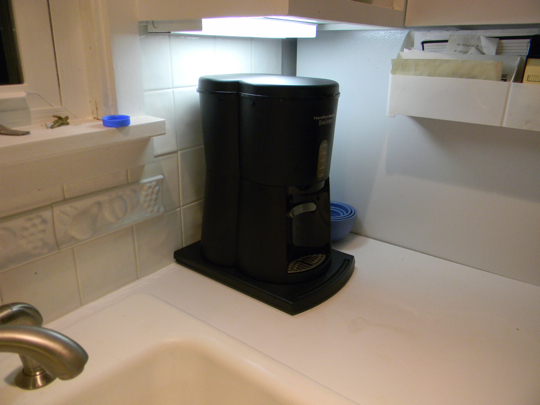 If I push it back against the wall (which is how I think it should be since it looks nicest), and center the coffee maker on the caddy (again, it looks nicest), it doesn’t slide out far enough to open the top. Whatever. I decided to switch it around and use the little measuring bowls to hide the gap. (You can see it in the banner photo.) That, and the dirty plates, cups and half-eaten bag of Cheetos on the counter, should detract from it’s lessened beauty. I just can’t abide lessened beauty. I’ve never seen that device before. I have to schedule more time for infomercials! Hey -- to make that setup work, I would suggest cutting a hole out of the bottom of your cabinet. That way you could lift the lid all the way. You are good at cutting holes in things.